Vince was my first dog, named after inlaws too numerous to mention. What do dogs dream about? Do they really dream when they’re sleeping and kicking their legs or, as some say, is all that just a physical release? Sometimes, when my dogs have awakened, I can tell that they have just been “someplace else” and they’re a little confused. For “St. 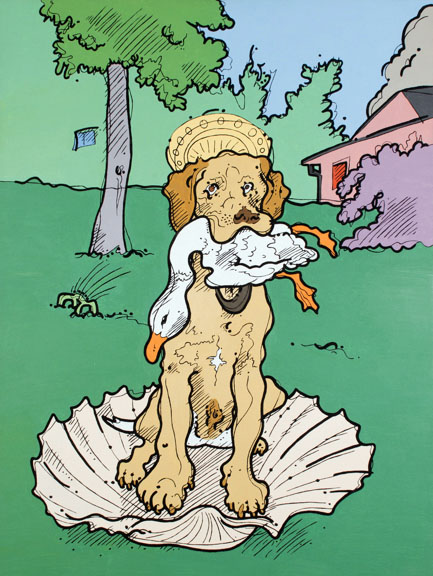 Vince” I borrowed the half-shell from Sandro Botticelli’s “Birth of Venus” and set it afloat on waves of suburban grass. The halo also came from the Uffizi. The smoke seen coming from my neighbor’s house represents smoke coming from my neighbor’s house, an actual event and a David Lynchian touch in the otherwise peaceful Sycamore Hills.